The Malaysian Team returns today after a gruelling battle in Dresden Germany. There was high expectation on the Malaysian Team to perform, placed 73 in the list as to secure some title norms and maybe to spring a surprise or two. But the Olympiad is no ordinary meet where each country would only send in her top or leading players with the aim of success by whatever yardstick. Our players indeed performed to their expected levels although the ranking did drop to 96. IM Mas did well to score against higher rated GM Mateo Ramon in Round 5 or later on even clinched a draw against GM Matamoros Franco Carlos. Likewise FM YW Lim were able to hold his fort with draws against his stronger opponents GM Gustafsson Jan, GM Markos Jan and GM Lenic Luka. However to achieve success beyond the ordinary one must plan to win and given the everchanging environment, with breakthrough ideas. For the records Armenia won the Open title while Georgia clinched the Woman section. Within Asean, Vietnam put up a strong performance with 9th position in the Open section while the Woman's team slipped marginally to 26th placing, with both teams well ahead of the other counterparts in this region. MCF Council has finalised the travel arrangements for the 6-member Malaysian Chess Contingent to the 38th Olympiad scheduled in Dresden, Germany this month. The Contingent will leave for Dresden on Tuesday 11th Nov. 2008 on Flight Lufthansa (LH) 9743 at 21:00 hr KLIA and back again to Malaysia on 27th Nov. 2008, touchdown KLIA 19:15hr. We wish them success in our endeavour to bring glory to the country. Note: The itinerary and tickets will be given out by Hon Sec Greg Lau . Players may also contact our Travel Consultant En Mohd Kamal Surin ( email: ttt@tamimitours.my or h/p tel: +60126112012 ) for clarifications if any, on the flight arrangements and other travel requirements. Malaysia's current top player is IM Mas Hafizulhelmi (pic right ) with N/Rating of 2331 while top female player is WIM Siti Zulaikha ( pic above) rated 1961. MCF have in recent years adopted the chess rating data of affiliate Chess Association of Selangor (CAS) as the official National Rating list. For easy reference the current October list can be found at this site and this will be updated from time to time. Affiliates are urged to use this list as well as submit tournament results to MCF ( under portfolio of MCF Council member - IA Lim Tse Pin) for incorporation in the National Rating record. 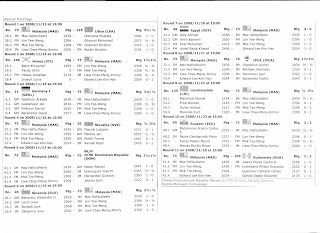 Other chess organisers may also refer to this record to rank the players in tournaments. MCF earlier endorsed 10 junior players to represent Malaysia in the above Championship. Selection was based primarily on top placings in the respective National Age Group held earlier this year, and on a case by case basis the strong performances in this year's Royal Selangor Open and DATMO as deliberated and approved by MCF Committee. The Championship ended last Friday. In the Open Section Yeoh Li Tian in the Under-10 Open Category scored a commendable 7 points out of 11 rounds in a field of 90 players. The best performance from this Malaysian hope was beating No. 7 Nguyen Ngok Minh Tri of Vietnam. His final 14th position is the highest achieved by the Malaysian contingent this time round. 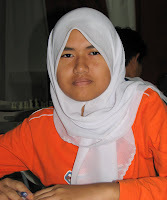 In the Girls' Section Alia Anin Azwa playing in the Under-14 category scored 6 points to be placed 29th position out of 79 players. Her best performance was probably despatching her higher rated opponent in round 8, WFM Efroimski Marsel (FIDE 2052) of Israel. 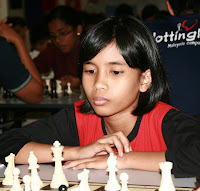 Nur Nabila in the Under-12 who also scored 6 points and placed No. 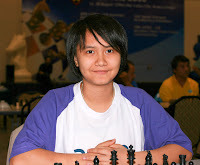 27 in the Championship showed a glimpse of her potential beating 20th place Tereshechkina Maya (FIDE 1961) of Russia. The other 7 results are Aron Teh (U-10) with 6 points, Elgin Lee (U-12) 6 points, Muhammad Shakir (U-14) with 4 points, Justin Ong (U-16) with 4 1/2 points, Puteri Rifqah (U-8) scoring 6 points, and Nur Najiha and Camilia both playing in the U-10 category collecting 5 points each. On the Championship, India topped the table winning 4 out of 12 individual Gold medals on offer, followed by Croatia with 2 Golds. Amongst the Asean countries only Vietnam secured an individual Gold medal in the Open Under-8 section while Indonesia managed a Bronze. 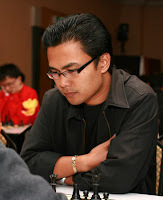 Ref: FIDE and vietnamchess websites.